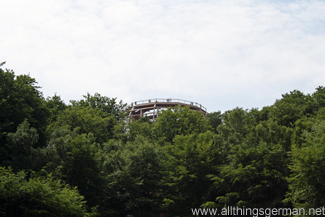 The first tower, however, starts at ground level and takes you up into the trees. 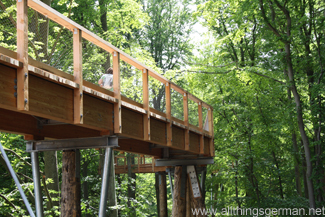 From there, an elevated section takes you through the woods to the second tower. On the way there are a number of things to do, all of them optional. There are some alternative routes that contain see-saw type arrangements or wobbly boards to make the walk for children more interesting. And there are sensory tasks, such as listening to bird calls through what look like gramophone horns. 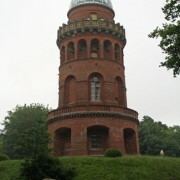 Inside the second tower there is a 70 year old beech tree growing, around which the tower has been constructed. 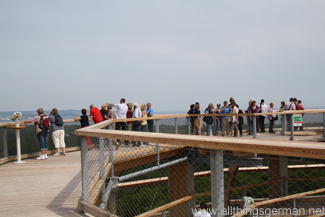 At the top of the tower visitors are 17m above the tip of the tree and can look down on it. 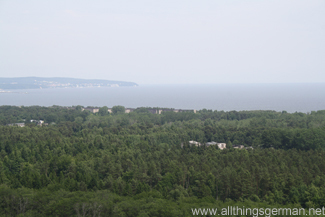 If the view is clear enough they can also see the church towers in Stralsund and Greifswald on the mainland. 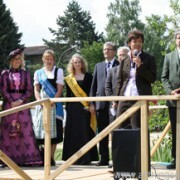 The complex was officially opened on 15th June, 2013, and is wheelchair accessible. This is achieved by there being no steps on the way up. Instead, the towers are circular and the path is laid around the circle in the spiral shape, with the slope at no more than a 6% incline. Apparently, the staff all had a go at it in wheelchairs before the opening so that they could understand what someone pushing one or wheeling it themselves required in effort to get to the top. Anyone who does not like heights is advised to stay to the middle of the path and keep their eyes on the construction in front of them, and definitely not to look down. In my opinion with the lack of steps and the slow incline it is actually less of an effort to get to the top and so causes less dizzyness. And just in case someone does feel that they cannot go any further or has any other problems, there are places to stop and rest along the way and also an emergency number to call if they need rescuing. The journey back down continues along another elevated section before coming to a flight of steps, but here there is also a lift. They both come out on the ground floor at an exhibition about the woods. 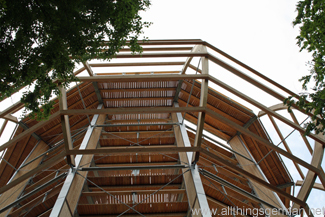 The staff at the complex are proud of the fact that it is almost entirely made of wood, even the towers. These do, however, have metal supports worked into them. With the length of the walk including both towers being almost 2km, they recommend taking at least 3 hours to see it all, including the exhibition. 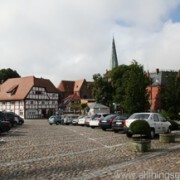 The complex is located near Prora on the L293 and has its own car park. It is open from May to September between 9.30am and 7.30pm, in April and October from 9.30am until 6pm, and from November until March between 9.30am and 5pm. Last entry is an hour before closing. Tickets costs €9,50 for adults, €7,50 for children between the ages of 6 and 17, students, pensioners and the disabled pay €8 (prices and times correct as of August 2013). Wow! It looks great. 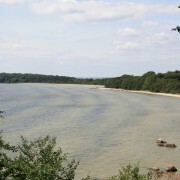 Reallly makes me want to go back to Ruegen. It’s on my list of places to see in Germany!